The Defense Department’s enterprisewide cloud solution will give warfighters the information they need at speed, providing the critical battlefield advantage in the wars of tomorrow, DoD officials told reporters. "It's about data,” DoD Chief Management Officer John H. Gibson II said at a Pentagon roundtable. 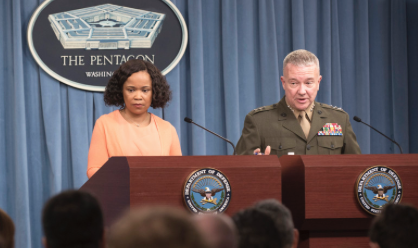 Chief Pentagon spokesperson Dana W. White and Marine Corps Lt. Gen. Kenneth F. McKenzie Jr., director of the Joint Staff, brief reporters at the Pentagon, April 19, 2018. DoD photo by Air Force Tech. Sgt. Vernon Young Jr. The warfighters’ accessibility to data, timeliness of that information and the security of the data, along with the ability to use that data for machine learning and artificial capabilities, will give the competitive edge in the wars of tomorrow, he said. That will allow the warfighters to “dominate in the battlefield," he said. The first priority of Defense Secretary James N. Mattis is to increase lethality, Gibson pointed out. "We see this effort as doing just that," he said. Machine learning and being able to process data at machine speeds will be critical components in the wars of tomorrow, said Robert Daigle, director of cost analysis and program evaluation in the Office of the Secretary of Defense. “Arguably, it is a critical component of how the warfighters of today should be fighting, if they had the capabilities," Daigle said. The best solution for the department is to have a single cloud solution, he said. Multiple cloud solutions would add to the number of people involved in the process, demand increased security measures, cost more than a single cloud solution, and hinder warfighters through the added time and layers in the bureaucratic process, he explained. The wars of tomorrow will center on the ability to process massive amounts of data at machine-learning speeds, he said. “Anything that detracts from that is a degradation in the capability that the department is providing to the warfighter,” he added. Known as the Joint Enterprise Defense Infrastructure, or JEDI, Cloud, the planned contracting action is a full and open competition. It is a two-year contract with two option periods – for five years and then three – for a potential 10-year contract, Daigle explained. The draft DoD JEDI Cloud request for proposals went live following a March 7 industry day. The final request for proposals is expected to be released in May, with an award in fiscal year 2018, DoD officials have said.